It was originally one of many small hunting camps established by Mohican people, who eventually sold or traded their land to settlers, though it remained a popular stopping place and river port during the time of the American Revolution. It was said that there was a fort there but it was more likely a small colonial blockhouse. 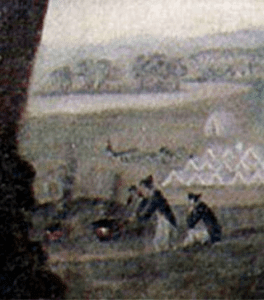 During August and September in 1775, General David Wooster’s Connecticut Provincials chose this place to bivouac over places in and around Albany. At the time, Albany was crowded with men who were preparing to invade Canada. Connecticut Provincials began to arrive at Half Moon during mid-August. 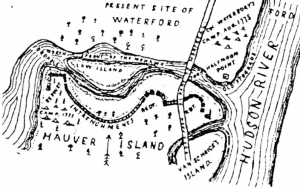 Colonel David Waterbury, in Wooster’s Brigade, led about 400 troops and set-up a military camp in an area north of Hauver (Peebles) Island in present day Waterford. Wooster’s men were said to be well equipped and supplied with all necessary provisions when they arrived in Half Moon. General Philip Schuyler, the commander of the Northern Continental Army, was assured that Wooster’s men needed no provisions from Continental stores and magazines. Waterbury’s camp likely consisted of a couple cabins or marquee shaped tents for officers. These had vertical walls that allowed officers to stand straight up unlike wedged shaped (pup) tents for enlistees. To insulate men from cold and damp ground they slept on a bed of hay, leaves or hemlock branches. 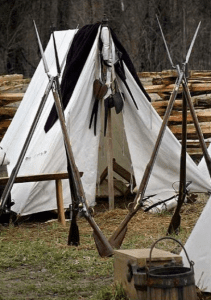 New York officials advised that they, “supplied Gen. Wooster with upwards of 200 tents made of the very best materials.” Typical specifications for soldier’s tents called for strong linen or cotton fabric. This fabric was commonly called English Duck or Ravens Duck. From two to four officers and/or their servants bunked in this style tent. While up to six privates utilized a single pup tent. Waterbury’s camp was probably laid out in parallel rows of about sixty tents in total. For local residents it was a sight to behold. Each tent was issued an iron kettle for cooking but messmates furnished their own utensils. Typical meals consisted of meat and vegetable stew and a type of baked bread called “firecakes.” Spruce beer or a ration of rum was typically furnished. Beer was made with fresh spruce needle clusters, molasses and a ration of rum. Each man’s ration was four-ounces of rum mixed with three parts water. 4. Pour mixture over hot flat rock and flip it over to cook other side. During hot weather it was especially important to maintain sanitation in Waterbury’s camp. One can imagine that this was an ongoing challenge. Under hot humid conditions bacteria and micro-organisms thrived in standing water and in the butchers waste pile. These places were breeding grounds for disease carrying insects and varmints. Disease became the major impediment to the success of Schuyler’s 1775 Canadian Campaign. A variety of illnesses occurred in camps like the one at Half Moon and contagion flourished because of close quarters. Hospitals in Albany overflowed with men who were sick with malaria and smallpox. For lack of proper care and medicine, many sick were literally disabled. Some of Wooster’s men were put-up in private residences at extreme cost. If any were lucky enough to recover quickly they rejoined their unit. However, hundreds of men got worse and were eventually were furloughed by regimental surgeons. When they were well enough to travel, they were shipped home to recuperate. Unfortunately, contagious diseases and their sources were not well understood, so conditions got worse instead of better. Although mass inoculation for smallpox was known to check this disease, it was expensive and required a two-week quarantine, an impossibility with the pressing need for soldiers, even sick ones. Disease created extremely hazardous conditions in camp but another more common practice contributed significantly to an unhealthy environment. Men being men, there was a strong temptation for them to relieve themselves wherever convenient. Any tree or bush was fair game. It was not for lack of knowledge that careless human waste disposal threatened. In New York City, where Waterbury was recently stationed, General George Washington and his officers insisted that latrines be dug and filled regularly. Additionally, trenches were dug and maintained around the entire camp periphery and each tent to insure proper drainage. Officers and sub-subalterns were responsible to establish appropriate sanitation rules and assign enough men to maintain sanitation. Sentries were responsible to insure that men followed the rules. Anyone caught violating the rules was subject to court-martial and discipline. Punishment often resulted in designation as a “colourmen” for extended periods. Appropriately, that meant the guilty were sentenced to dig and clean the latrines. Improperly cooked food was yet another source of sickness and disability. Everyone knows that stomach disorders result in debilitating cramps and dysentery. Safe cleaning and cooking practices were well known but inexperienced men sometimes overlooked them. Improper cleaning of utensils was another source of sickness. 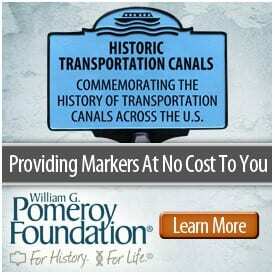 It was the job of company officers to insure that proper sanitary practices were followed. Waterbury himself may have resided away from the threat of contamination perhaps at Widow Peebles Tavern. It was located a little north of the Half Moon camp. Taverns were the equivalent of today’s hotels. High ranking officers willingly paid the cost of a room with a comfortable bed. Beds consisted of a slatted wood frame, occasionally it was covered with a luxurious feather mattress. More likely, the mattress was stuffed with fresh hay or straw. Tavern accommodations typically included so-called refreshment – a meal and beverage. After patriot forces retreated from Fort Ticonderoga on July 6, 1777, about 5,000 of them made their way to the vicinity of Half Moon. Continental Army officers quickly developed a plan to stop the advancing British before they reached Albany. General Schuyler drew the line-in-the-sand just south of Half Moon. Accordingly, patriots immediately constructed earthworks and fortifications on Hauver (Peebles) Island. General Horatio Gates’ aide-de-camp wrote on August 17, 1777 that the army was still at “forts near Half Moon.” At the time, the British army was stalled about fifty miles north. Upon further consideration however, Gates’ Engineer recommended moving the patriot army to a better location near Stillwater. In accordance with these recommendations the army left the Half Moon area and relocated near Stillwater. Patriots subsequently confronted the British Army at Freemans Farm, Bemis Heights and at Satatoga where the bedraggled British Army finally surrendered. A more complete discussion of Waterbury’s Half Moon encampment can be found in Brian Barrett’s book, Wooster’s Invisible Enemies available at Amazon. 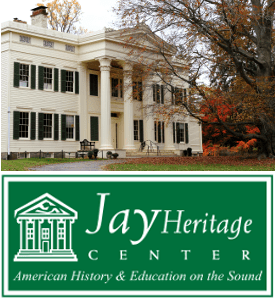 Additional information about the role of Half Moon as a stop-over for militiamen during the 1777 Saratoga Campaign is presented in his book, Burgoyne’s Nemesis: New England Militia, also available on Amazon. Images, from above: Map of present site of Waterford courtesy The Burgoyne Campaign by Henry Clay Maine; Enlisted men’s camp and tent and Camp sketch courtesy revwar75.com.